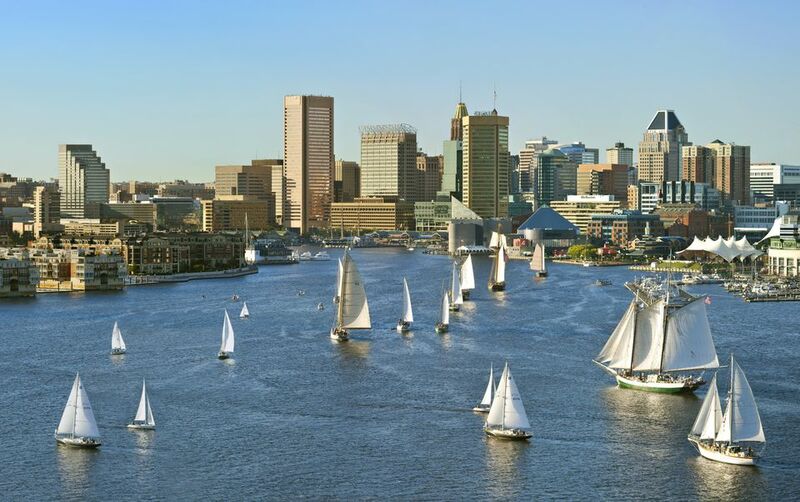 Whether you're living in Baltimore and looking for an escape or visiting the city and want to know of a quick day trip you can make within driving distance, the area around Baltimore offers a variety of fun activities perfect for the whole family. From a trip to the Eastern Shore of the Chesapeake Bay to a hike up to beautiful waterfalls in Shallow Falls State Park, the Northeast United States is full of wonder and adventure that's easily accessible from Baltimore—all you need is a car, a map, and some details about these unique destinations and you're ready for a weekend getaway you won't soon forget. Read on to discover the top five weekend getaways from Baltimore, and please note that the following trips are arranged in order of distance by car from downtown Baltimore. Just 70 or so miles from Baltimore, the east side of the Chesapeake Bay in Maryland is known as the "Eastern Shore" and is full of charming towns, sandy beaches, and natural areas perfect for a day-trip with the family. While there you can visit the Chesapeake City Historic District featuring restored houses, inns, and bed & breakfasts as well as some great local shops, the Canal Museum, and outdoor summer concerts, or you can visit the Blackwater National Wildlife Refuge to get in tune with nature in the primeval forests of Cambridge, Maryland. Among the many attractions near the Eastern Shore, visitors can find wild ponies at Assateague Island (150 miles away), catch some waves in Ocean City (150 miles away), or go antiquing in St. Michaels (70 miles away). Other options within Maryland include Chestertown and Cambridge, while Chincoteague Island, Tangier Island, Onancock, and Cape Charles are across the border in Virginia. One of the United States' great national parks is just a few hours away (160 miles) from Baltimore, but if you make the drive, you won't be disappointed by the natural beauty of the Blue Ridge Mountains found in the Shenandoah National Park, which is typically full of wildflowers in the spring and impressive foliage in the fall. You can either cruise along Skyline Drive from the comfort of your car or hike the gorgeous mountain trails by foot to discover cascading waterfalls and quite wooden groves, and either way, you'll discover something everyone can enjoy in this 200,000 protected area of nature. Don't forget to make a side trip to Luray Caverns in Luray, Virginia, an underground maze of stalactites and stalagmites which was first discovered in 1878 and now offer guests guided tours through the labyrinthine caverns. Deep Creek Lake is the largest inland body of water in Maryland, containing over 68 miles of shoreline, and is located just 179 miles from Baltimore. This manmade lake makes for a great place to boat, water ski, or wakeboard, and is full of freshwater fish and aquatic birds. Offering a variety of family-friendly activities over the summer and cozy mountain lake accommodations in the winter, Deep Creek Lake is a great getaway destination for all ages. With plenty of bars, restaurants, and shops outlining the lake's shores, there's no shortage of things to do on your trip to Deep Creek, Maryland. In the winter, you can also stop by Wisp Resort, a nearby ski resort and lodge that offers visitors a variety of fresh-snow slopes, freestyle terrain courses, and even an ice skating rink. If you're a fan of winter sports, be sure to stop by this great destination in the Blue Ridge Mountains. A favorite of eighth-grade trips to Washington, D.C. to explore our nation's early history, Colonial Williamsburg in Virginia is 192 miles from Baltimore and the largest living history museum in the United States. Step back in time at this huge village of perfectly restored and maintained colonial homes and reenactments, which often features seasonal events like the "Haunting on DoG Street" for Halloween and the "Grand Illumination" to celebrate the Christmas holiday season. Once England's oldest, largest, and wealthiest colony, Colonial Williamsburg is represented by 88 original buildings and hundreds of other homes, shops, and public establishments. You can even fire a traditional musket or learn how to make butter the traditional way in one of the various reenactments happening throughout the village. If you drive 195 miles west from central Baltimore, you can pull your car over and explore one of the most beautiful nature preserves in Maryland: Shallow Falls State Park. This park is known for having Maryland's highest free-falling waterfall, Muddy Creek Falls, which comes crashing down a total of 53 feet before disappearing among the downstream rapids of the Youghiogheny River. The 1.25-mile trail through the area allows hikers to see some of the most breathtaking sights in Western Maryland at a leisurely pace. Besides making use of the picnic area, playground, and hiking trails, you can camp amongst the same hemlock trees Thomas Edison, Henry Ford, and Harvey Firestone used to sleep under when they were shaping the course of history in the United States.